Available on Designated Wednesdays By Pre-consult. 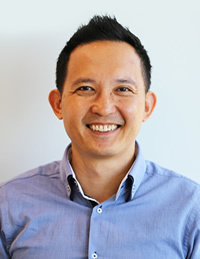 In addition to earning his Bachelor of Dental Science from the University of Western Australia in 1996, James holds a Postgraduate Diploma in Implantology that he attained in 2011. Moreover, he obtained a Master of Oral Implantology at Goethe University in Frankfurt in 2014. He also was awarded Fellowship status from the International Congress of Oral Implantologists in 2011. James has the distinction of being only one of two WA dentists who was accepted into the esteemed programme for the Postgraduate Diploma at Charles Sturt University in NSW. To stay abreast of the latest developments in his area of expertise, James is always attending various local and overseas conferences and seminars in implant dentistry and oral surgery.